Before we start with the germination there is one crucial thing to keep in mind: cleanliness is a big factor when working with your offspring and it is not limited to the tools and materials you work with, but it includes YOU! For example, if you are a (tobacco) smoker ... did you know nicotine is poisonous to cannabis plants just as it is to you? So, work like a surgeon and use antibacterial soap to wash your hands before every operation. Tweezers, scissors, pots, buckets - it ALL must be clean for maximum results at the lowest possible risk of contamination. For a perfect start for your seeds, you should place them in a moist, cosy environment. Instantly after breaking through the shell, the little root will seek for moisture, so make sure to provide a moist environment for the new life; if you don't, the seed will die. Keep a high humidity throughout the whole germinating process. 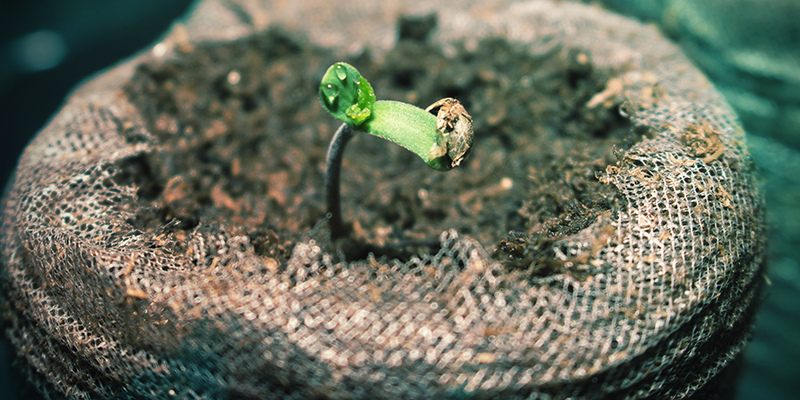 While there are a number of cannabis seed germination methods out there, such as the “paper towel method” or germinating seeds in a glass of water, we tend to recommend simply germinating seeds in soil. It is simple, efficient, and how nature intended it to be. Then you plant your seeds directly in soil, you don’t need to repot or move them, which helps to avoid damage to the seedling. In addition to this, planting seeds directly in soil is very easy. Simply put the seed about 0,5cm deep into the soil and cover the seed lightly. Keep an eye on the environment and keep it warm and humid - 20°C is the ideal temperature. Keep soil moist, but don't saturate it - waterlogged soil can do more harm than good. You can place a lamp above the seed to provide the adequate temperature for germination. 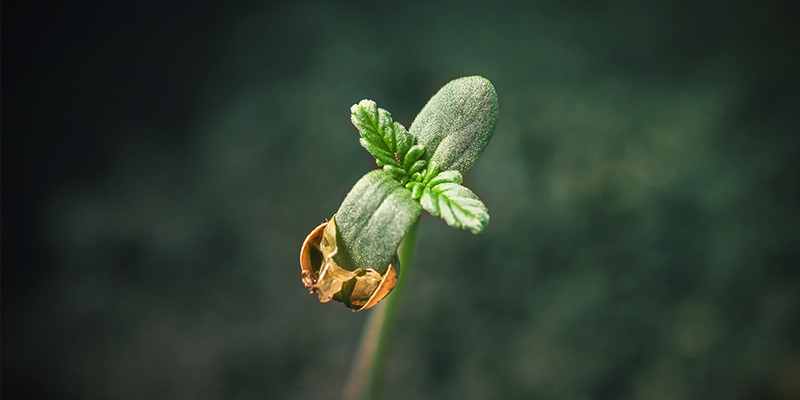 Your precious cannabis seed will happily sprout within a few days! Take note that your seeds do not need any nutrients, at least for the first two weeks of growth. New growers often make the mistake thinking they are helping by adding nutrients in this early phase of growth. DON'T! The seed contains everything it needs to grow for a couple of weeks. Add additional feed runs the risk of burning the seedling out before it has had the chance to even begin growing. Feeding your seedling with plain water ensures that it will grow strong roots. If you really want, you can use a root stimulator although it isn’t absolutely required. The Smart Start seed germinating kit provides the easiest and “smartest” method of cannabis seed germination - with very little risk and with the highest chances for success. This kit contains everything you will need for germination. It comes with 20 small seed pots filled with compost and a packet of Stimulator Mix. The included stimulator activates the essential microbial life in the compost for a fast and healthy growth of your cannabis plants! All you need is some water and of course some seeds, and you’re ready to go! Whether you are using a warming light, placed over your babies or a heating pad, keep your seeds warm. Basically, there are three components to successful germination: warmth, moisture and darkness. And even after stepping out of the dark period your seedlings will need high humidity. There are various methods to successfully germinating cannabis seeds, but we'll limit it to three here; the three easiest and almost dummy proof. Let us help you with the first step toward a heavy marijuana harvest. Of course, there’s more than one way to germinate your precious cannabis beans. 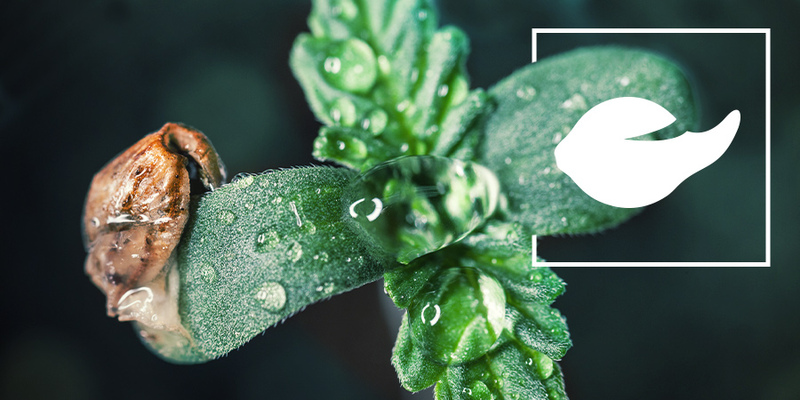 In fact, we would like to share three of the very best methods and some useful tips to get your marijuana garden off to a flying start. Cannabis seeds are classified in two distinct categories regular or feminized. Of course, there is a myriad of different strains, hybrids, and even autoflowering varieties. But at the end of the day, they will fall into one camp or the other and hopefully not somewhere in between as is the case with hermaphrodite or intersex plants. Before you even contemplate germinating your choice of cannabis seeds it’s important to understand what you are dealing with. Regular seeds are cannabis seeds of both gender, meaning the packet is a mixture of male and female cannabis seeds. While feminized seeds will be all females, well 99% of the time they will be. Occasionally a hermaphrodite will make an unwelcome guest appearance in the grow show. Intersex means a plant which displays both male and female characteristics, usually observed, to the horror of the grower. This rogue pollen has the potential to self-pollinate and/or pollinate the rest of your crop. Hermies can turn top shelf buds into seeded schwag with just a few pollen granules. Early detection and removal of the culprit is the only course of remedial action. Excessive Stress can induce the condition. If this occurs, the grower is at fault. When cultivating feminized beans ensure you purchase from a reputable breeder and if it goes wrong you have only yourself to blame. You really do “reap what you sow” when it comes to cannabis cultivation. Getting it right from the very beginning of the grow and following best practice is the most effective way to avoid pitfalls later in the grow. Before we get into specifics let’s get one thing straight, cannabis should be germinated in darkness, and only a damned fool or a liar would recommend germinating your beans in the light. 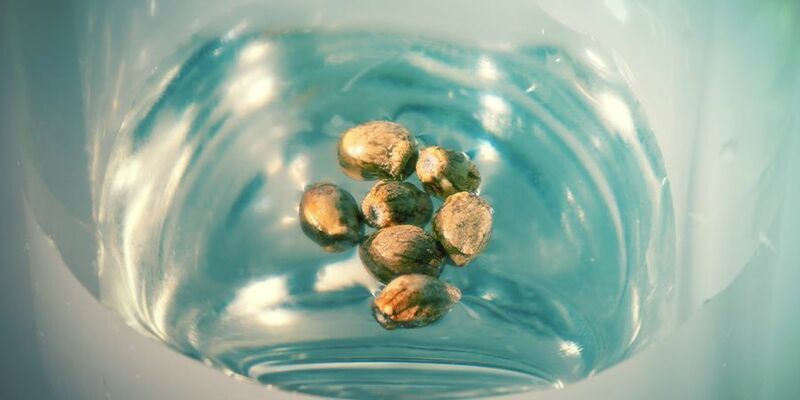 Perhaps the simplest no-fuss method of cannabis seed germination is to plant the seed directly into your selected medium. The grower has many choices depending on what type of crop you want to cultivate: soil, Rockwool, coco or hydroponics. Organic purists prefer planting directly into soil or coco, or a blend of the two. Digging a finger nail depth hole in the medium to place the seed in and cover over before applying a splash of water to moisten the medium is sufficient. Then it’s time to play the waiting game for usually 3-7 days before you see a seedling emerging. It’s best the medium remain moist, but not waterlogged. Keep a spray bottle of pure water handy to maintain an effective wet-dry cycle from the start. Cannabis roots best in a moist medium with a 20-22C temperature range. Ideally, humidity should be high between 50-70% and maintained in this range throughout vegetative growth right up to the bloom phase. Our silver bullet solution to cannabis seed germination is the Smart Start kit. It’s a particularly useful starter medium for novice growers and more experienced growers that like to experiment. All you need is a pack of high-quality cannabis seeds and some water to get started. Our second germination technique is the old “Paper Towel Method”. Simply place your cannabis seeds between two sheets of kitchen roll, grab your spray bottle and moisten but don’t soak the towels and voila! We recommend placing the moist paper towels in a lunch box with the lid off, then stand the lunch box on its side and allow gravity to also assist the germination process. As with all germination methods, they are most effective in complete darkness at room temperature. The bathroom cabinet is an ideal place to store your lunchbox of magic beans. Bathrooms are damp and cabinets are dark, so it really does make sense. Give the odd spray of water to keep the paper towels constantly moist and in no time literally 24-48 hours you will be seeing tap roots bursting out. The only tricky part with this method is that it requires a steady hand to transfer your freshly germed beans into pots or containers without damaging the fragile tap root. Burrow a hole in the medium with a nail or screw 2-3cm deep then insert. Handle with care and try to pick up the seedling head first and gently transplant easing the roots into your hole in the medium. If you happen to be a total klutz don’t worry simply lay your beans, gently atop of the medium and cover them over carefully with just a pinch of top soil. PLEASE NOTE: We do not recommend this method because, more often than not, the paper is too wet and the seeds simply suffocate or begin to rot. To complete our trinity of germination methods we have the Glass of Water Method. Simply drop your beans into a glass of pure water and wait for the emergence of a tiny rootlet. This method is not very scientific nor is it 100% effective, however, it is nonetheless an often used method of germinating seeds quickly. Sure you may get a few kills but so long as you don’t spill or accidentally drink the water the majority of your beans will be good to go in 2-3 days. We don’t recommend placing the glass next to your night stand, especially if you get thirsty during the night. The journey to every heavy harvest begins with the germination process. Get it right, and you’ve made the first step toward achieving your objective. Get it wrong and your cannabis grow is done before it’s even begun. So please follow our friendly advice and get it right. PLEASE NOTE: This is not our preferred method, as seeds placed in a water glass are very likely to suffocate or rot. The cannabis industry is ready to advance into the rapidly approaching year of 2019. Get ready for some fresh and powerful genetics to hit the scene. This first technique is the technique we recommend. 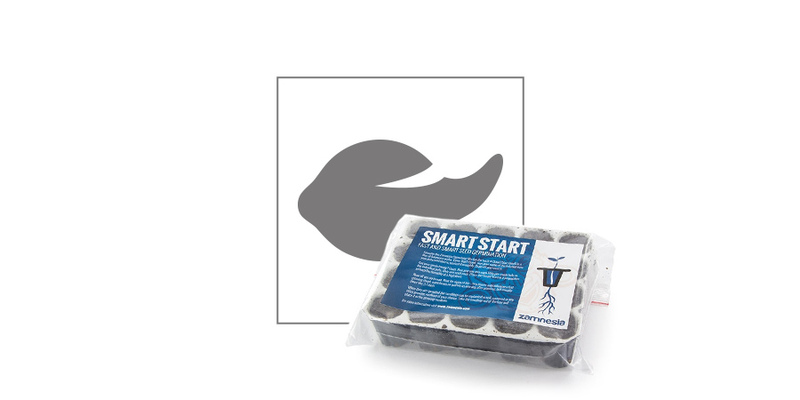 We recommend to use the 'Smart Start' to germinate seeds. A lot of mistakes are usually made using the first and second germination technique. Put the seeds directly, about 0,5cm deep, into the soil and place a lamp above. If you are using wet cotton wads, place them in the dark, at around 20-22 degrees (soil/water temperature) and make sure to replace the water daily.